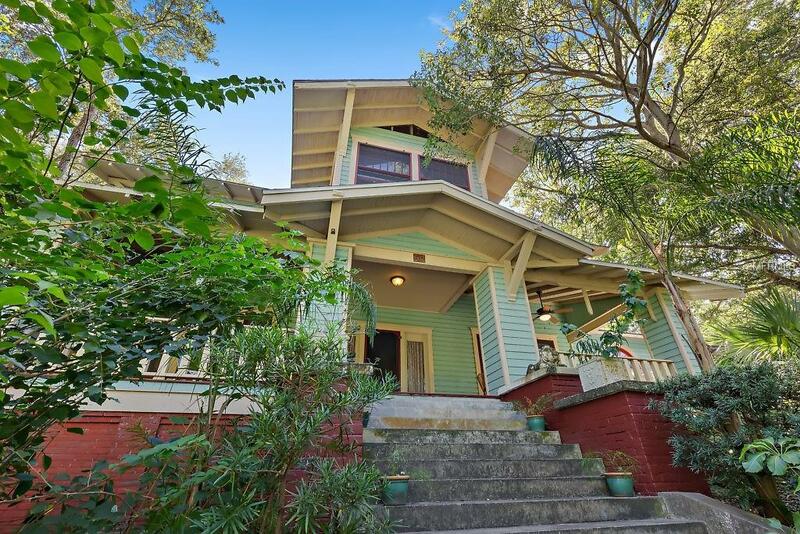 Majestic 1910 hill-top home with craftsman and prairie elements in HISTORIC ROSER PARK lovingly cared for by the same owner for 25 years. This home aptly named "House Beautiful is located on a brick-lined cul-de-sac and sits atop a hill looking down on lush tropical flora and Roser Park. You can see this expansive view from a huge covered deck in front. This large home boasts hardwood floors throughout with crown molding. With three bedrooms and a guest bath upstairs there is ample room for a family or to host out-of-town guests. The large master bedroom has its own bath with a roomy walk-in closet. A bonus garden room on the first floor, not included in the square footage, would be the perfect place for a sunny den or office. The large front and side yards are perfect for spending quality time outside and there may be room for a pool. This home has been extremely well maintained with over 2200 sq.ft with separate dining and living room areas. Charles Martin Roser real estate success was funded by his culinary invention, the Fig Newton cookie, of which he sold the recipe along with a factory to Nabisco. When he originally listed the home He described it, "With winding steps leading up from the drivebeautiful homes sit on the very banks of babbling Booker CreekIts wonderfully beautiful semi-tropical scenery with it countless flowers, plants, and shrubs transformed into natures garden. This magnificent home awaits your personal touch. There is no other place this special in all of St Petersburg.